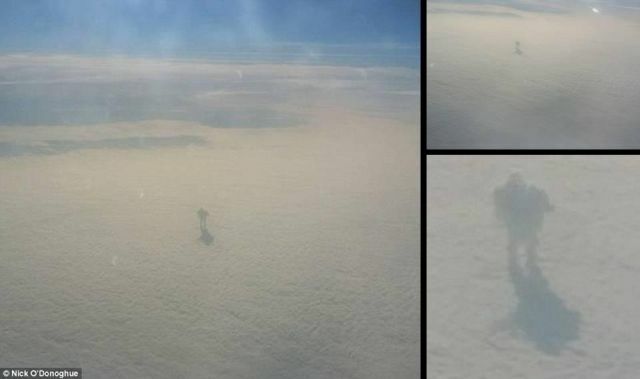 Flyer Nick O’Donoghue, 30, a software support team manager from Ireland, was on board an EasyJet flight from Austria to London Gatwick when he noticed the bizarre figure in the sky and grabbed his camera. Mr O’Donoghue however, told MailOnline Travel that he believes the figure resembled the Michelin man. He said: ‘I was flying back from a work ski trip in Austria, I was on the window seat with two work colleges beside me. ‘They were talking like crazy and I was gazing out the window, as you do. I could see this figure in the distance in front of us and then as we flew closer this shape appeared. ‘I asked the ladies beside me to look at it too in case I was seeing things. They too were amazed! I then took some pictures and then the aircraft slowly passed it. ‘It was in view for about two minutes as it was a good bit away in the distance. To me it looked like the Michelin man but to be honest I have no idea what it was. ‘Some comments online said it was smoke stacks below and the heat from them pushed up the layer of clouds, but I don’t think so as they looked very close together. In October thousands of people in China claimed they had seen a ‘floating city’ in the sky.